One can never truly imagine what life is like serving in Afghanistan. I have caught glimpses when talking to men and woman who have been there and still only scratched at the surface. What I have learnt is that there is a companionship, a loyalty towards each other that creates a bond that goes above and beyond anything I have seen before. You can still see this in the faces of our soldiers from wars long passed and I know from the stories shared by my late father-in-law that all they witness and experience never leaves their side no matter how many years have past. The journey from where Brin was in Helmand to Kabul was 421 miles, a journey that would take over eleven hours through some of the most dangerous and toughest terrain. Of course, it would have been easy to fly but restrictions on the transportation of strays would have meant serious consequences for the soldiers and death for Brin. But, with the clock ticking, something had to give. On a secret journey that took five days, due to constant delays due to severe sandstorms and other set backs, Brin sat hidden in a special box made for him by the lads out of bomb proof material. Not a sound did he make during that time, as if he knew his life, and others, depended on it. Five days of confinement for a dog who had roamed vast deserts, escaping all the dangers and horrors that befall so many animals in that area, proved to be just another moment in his life to cope with… and he did just that. 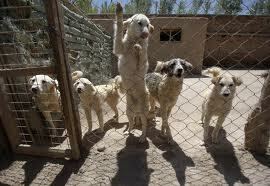 On his arrival at the Nowzad shelter the staff there adored him. His stubborn and independent nature made them laugh coupled with his ability to trust and befriend humans unknown to him. Brin would stay at the shelter for two weeks due to screening for rabies or parvo for, if he showed any of these diseases, then his journey onwards would be in doubt.